Work included Engineering, Procurement, Civil Works, Installation, Erection & Construction of Tank Gauging, Cooling & Fire Fighting System, Associated Piping, lightening Arrestor, Dikes around the Tanks and Walkways & Roads between them. 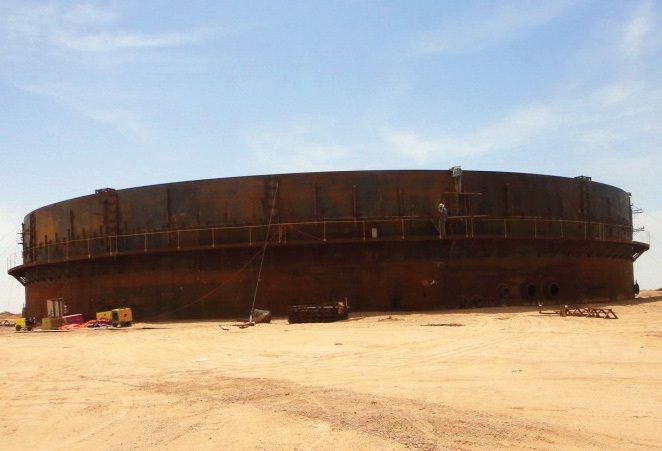 Construction of 4 * Double Deck Floating Roof Crude Oil Storage Tanks; each of 30,000 M3 Capacity at Buzurgan Oil Terminal located in Missan Governorate, South of Iraq. • Empty Weight: 835 Metric Tons. • Operating Weight: 28500 Metric Tons. • Tank’s Dimensions: Internal Dia. ; 48 Meters, Overall Height: 18,3 Meters.